Owning signed volumes by Vincent Starrett is a special treat. It puts me a slight step closer to the great man himself. The fact that Starrett signed so many books means there are a lot out there to be enjoyed. A series of signatures from a volume of Chicago Murders. In this outing, let's take a look at an unusual volume, Chicago Murders. Published in New York by Duell, Sloan and Pearce in 1945, the book was the second in a "Regional Murder Series" that brought together true stories of murder. Volume 1 featured New York City, Volume 2 had stories from Chicago and Volume 3 was set in San Francisco. To celebrate the publication of its Chicago book, a signing party was held with the authors lined up in a row so that purchasers could walk down the line and get their books autographed all at once. (Sounds like a scene from a modern science fiction convention to me.) A typical example from this little publicity stunt looks is seen here. John Bartlow Martin and Craig Rice did not sign this copy. A specially signed volume of Chicago Murders for the book's editor, Sewell Peaslee Wright. But there is also a specially signed edition of this book, with the authors offering special messages to S.P. Wright, who edited the volume. Wright was a popular mystery writer of the era, who later made a reputation for himself writing pulp science fiction. Books like Vampires of Space, The Terrible Tentacles of L-472, and The Terror from the Depths. They sound like fun. I should try tracking them down. Before moving on, I wanted to note a bit about one of the contributors. Otto Eisenschiml was born in Austria in 1880, where he studied chemistry at the University of Vienna. After emigrating to the U.S., became president of Scientific Oil Compounding Company. An amateur historian with a fascination for Lincoln's assassination, his book on the topic proposed a conspiracy masterminded by Secretary of State Edwin Stanton. The book caused a furor when it was published and Eisenschiml defended his claims until the end of his life in 1963. He's not the kind of guy who would seem to be interested in murder or who would naturally be a friend of Starrett's. But it's interesting to note that Eisenschiml was among those early members of the Hounds of the Baskerville (sic), so there is a definite Sherlock Holmes connection between them. Let us return to the page of inscriptions from the authors. And it is here that we see Starrett at his most whimsical. 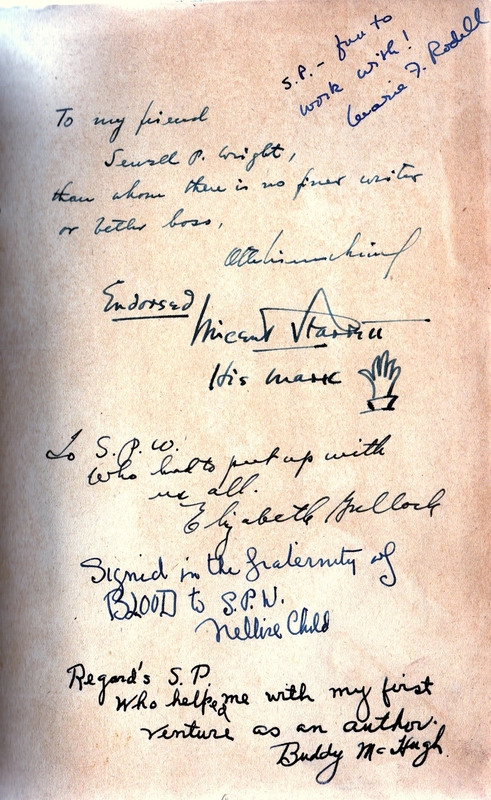 While the others chose to offer their brief thanks and best wishes, Starrett took an unusual route, even for him, signing the book "Endorsed/Vincent Starrett/His Mark" followed by a waving hand. It's the only time I've seen such a thing, and it's a sign of Starrett's role as the dean of the authors, having a little fun with his colleagues in crime. Starrett's contribution to this little volume, besides the waving hand, is the opening story in the anthology, "The Chicago Career of Dr Cream — 1880." Dr. Cream was an abortionist, in a era where backroom abortions resulted in the death of the mother with alarming regularity. At least three Chicago deaths are attributed to Cream, and he served time in prison for the poisoning death of one Daniel Stott. Stott's wife, Julia, was Cream's mistress. Despite their relationship, Dr. Cream had no difficulty tossing Mrs. Stott under the horse-drawn carriage. "I believe Mrs. Stott poisoned her husband," he said in a newspaper interview. "I knew her to be a bad woman, and I kept away from her as much as I could." After being released from prison, Dr. Cream went to London, where he continued his unsuccessful career as an abortionist and his all-to-successful practice as a poisoner of prostitutes. He was hanged in Newgate Prison. There have been some efforts to identify him as Jack the Ripper, but Starrett does not dignify the old murderer with the serial killer's mantle. VINCENT STARRETT is the leading light of the Baker Street Irregulars, creator of the adventures of Jimmy (sic) Lavender, and columnist for The Chicago Tribune. "The leading light of the Baker Street Irregulars." However, I can't help but wonder what Christopher Morley said when he read that. A final note: To read another collector's exploration with Vincent Starrett and his signed volumes, let me recommend Kurt Zimmerman's blog posting, "A Bookman's Holiday with Vincent Starrett," posted in January 2013.